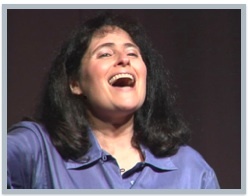 To view PPT presentations, click on highlighted speaker names below. 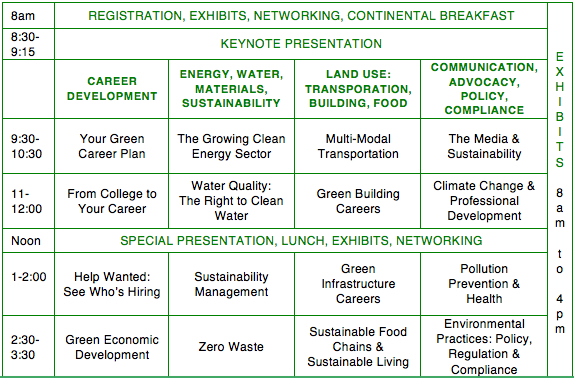 The Massachusetts Green Careers Conference connects stakeholders from education, business, government and nonprofits; green-career-ready candidates; and learners to advance workforce and sustainable development. Our exhibitors offer career resources and jobs. Companies were accepting resumes for more than 175 jobs. Make a world of difference by making a difference in the world. Keynote speakers will highlight the growing number of employers and jobs in the state’s expanding clean energy, water technology, and marine-related industries. Whether working for others or yourself, learn practical approaches to prepare your next career steps. Career development strategies, communicating with confidence, and pay equity really matter. The growing Massachusetts clean energy sector is a $10 billion industry and 2.5% of the gross state product. Job growth has been 50+% since 2010 and continues to rise. Learn about the Massachusetts Department of Transportation GreenDOT sustainability initiative, and research regarding younger and older generations seeking mobility alternatives. Hear about careers in transportation planning and management. Hear from career professionals about people they interact with, the power of the media, online messaging, and cultural trends. College representatives describe programs and career services including internships, co-ops, and job placement. The Clean Water Act was passed in 1972. Today water quality industry professionals manage our community water and wastewater infrastructure with state-of-the-art technology. Learn about the many career opportunities. In the United States more than 3.6 billion square feet of building space is LEED-certified. About 45% of new nonresidential construction will be green in 2015; this is a $120-$145 billion opportunity for green building professionals. Career experts describe work, education, and communication about extreme weather, rising seas, environmental degradation, and stewardship. Human Resource Directors describe their hiring processes, current job openings, and future prospects. Sustainability practices are increasing in communities, campuses, and companies. Hear from professionals with real-world experience in sustainability management. Towns, cities, and private landowners around the nation are working to expand and improve their urban forests, greenways, parks, wetlands and other “urban green infrastructure.” Come and learn about the professions and trades involved in this exciting work. Rachel Carson’s legacy continues with the groundbreaking research of Silent Spring Institute scientists and the Environmental Protection Agency’s (EPA) mission to protect human health and the environment. Government and local business partnerships create jobs and improve environmental and public health. Reducing consumption, turning organics into compost, recycling, creating jobs, saving money, and reducing pollution brings community members together, and beautifies the community. Career opportunities grow with consumer demands for local, organic food production and sustainable lifestyle preferences. Who creates policy, oversees regulatory processes, and enforces sound environmental practices? Hear from career professionals about environmental initiatives shaping our future. Carbon Offset for building energy for the conference and all conference travel is a donation to Green Marlborough, the local environmental organization.